To begin, take a look at your overall environment and design. Your look may be sleek and modern, or more free-form or even natural and tropical. 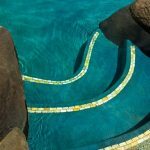 Once you decide on the general look and feel of your pool, it’s time to pick a type of tile. Your options include porcelain, glass or natural stone. Porcelain tiles come in a couple of finishes; abrasive, undulated, smooth, glossy and matte. The more abrasive the tile, the harder it is to clean and the more calcium will adhere to it. Smoother, non-undulated tiles are a better choice from this standpoint. Glass tiles are non-porous, so they won’t stain, fade or decay. They are also hygienic and will not promote spreading of allergens. However, glass tiles are more expensive than porcelain tiles. Stone tiles have a very natural look and a textured feel to them. Again, this also means that they will be a bit harder to clean and calcium build-up can be an issue. When deciding on color, there are several things to keep in mind—a light color pool will look bigger in small areas while a darker tile will have more defined lines. The tile color will also change with the brightness of the sun and reflections from trees and structures. If the area around your pool is shaded, a lighter color is recommended as it will still appear darker. Size-wise, there are multiple options also. The larger the tile, the less grouting needed, which again can help with lessening the calcium buildup. Six inches of waterline tile is standard and tiles generally come in 6” x 6”, 3” x 3”, 2” x 2”, 1” x 1” or 1”x 3”, but can also come in patterns that make up a 6” x 6” tile. When it comes time to pick your tile, visit our showroom to see all the beautiful options we have available to make that pool priceless!